Dune (also known as Shinigami-God of Death-Dune) was Luna's bodyguard. As a very powerful robot and Luna's bodyguard, he was hated and feared by many. Lyuze said that he once was considered the strongest robot. Few chose to get close to him; the closest person he had was Luna herself. 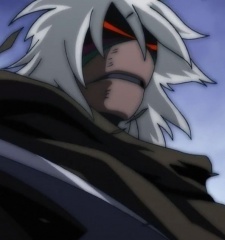 Very loyal to Luna, he was plagued both by physical and psychological ruin when she was killed by Casshern. Despite widespread rumours of Luna's death, Dune is determined to find and protect Luna once again. Dune first appears in episode 10, heavily damaged by the ruin. He is seen constantly calling for Luna and asking why she is dead, haunted by memories of his role as her bodyguard and unable to let go. Although his body has changed for the worse since Luna's death, he still is very powerful and can defeat many robots using sharp blades expelled from his body. In this episode, a flashback with Luna, Dune, and Liza shows that although others feared and hated him, Luna was kind and gentle, offering him flowers as thanks for his good work. Dune became sentimentally bound to these flowers, as they remind him of Luna's affection. Dune returns in episode 15, when more of his backstory is shown. His body has damaged further; sometimes he can barely move. However, he is still persistent in his pursuit for Luna. As Casshern was the one to kill Luna, Dune understandably holds a deep grudge against him - Casshern killed the one he most loved. However, after fighting Casshern, Dune realizes that his desire for finding Luna is far greater than his desire for revenge. Dune finally encounters Luna. He returns to his original body, which appears older but similar to the one from his flashbacks. He is rejuvenated, speaks more, and has become more reasonable. He starts to work again for Luna, taking care of her flowers as ordered. However, Dune becomes depressed-different from the serious expressions he wore in the past. He senses that Luna is different now and refuses her healing. Later, Luna orders him to destroy the flowers Dune is tending to, as some of them appear to be dying. Although displeased, Dune blindly follows her orders. Later, a group of bandits attack Luna's shelter, and Dune promptly prepares to destroy them. In the middle of the fight, however, the very flower that Luna gave him-appearing in the flashback in episode 10-falls. As the flower holds deep importance to him, Dune stops fighting to protect it, which unfortunately causes him to suffer quite a bit of damage. Having later been saved by Casshern, Dune does not manage to survive. Disgusted by Dune's state of near-death, Luna rejects him. Despite this, he dies in peace, believing that "a sun (Luna) is only there to shine, and just looking at it is sufficient."